← Pacifico Resort Community L1203 Now Ready To Rent!!! Everyone always asks “Cheryl, what is your favourite all day adventure tour?” I can tell you hands down without hesitation you can’t leave Costa Rica without a trip to Hacienda Guachipelin. Hacienda Guachipelin is a privately owned working ranch that they have opened up to tourists to come and enjoy. It is located at the base of the Rincon De La Vieja Volcano just north of Liberia. Once you get away from the beach and up in the untouched area you will quickly notice that the temperature cools off in comparison to the beach. The wildlife around the ranch is amazing as it backs up to Rincon De La Vieja National Park. 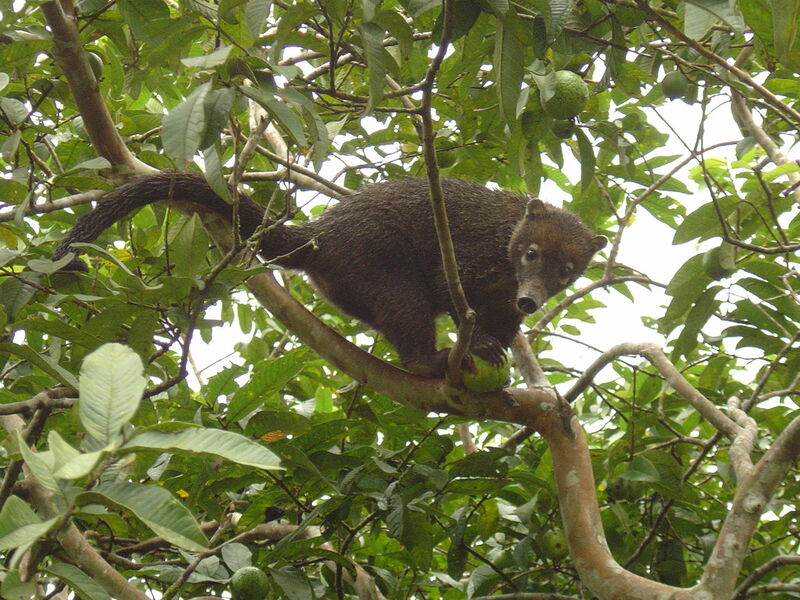 Three species of monkeys, beautiful birds including toucans if you are lucky, coati (like a raccoon crossed with an anteater), lizards, snakes (pretty hard to see…don’t let this scare you lol), etc. The owner Jose Tomas and his crew are amazing hosts. They are always flexible and client satisfaction is their first priority. I’ve been going for years and sending almost every client that comes and the only complaint I have had is that they had to come back home. The options of activities are endless and the staff is able to tailor the day to everyone. I recommend the all day adventure pass. This way you can pick two of the main activities and then they sneak everything else in. 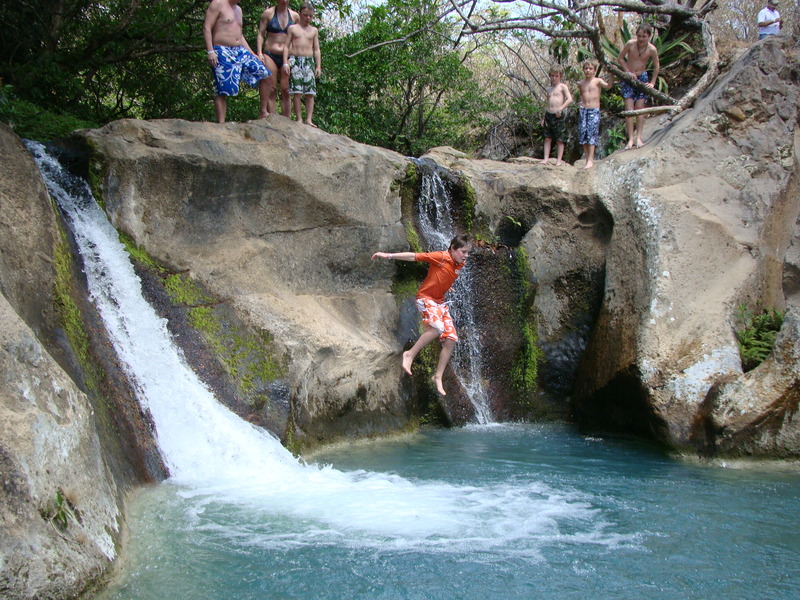 You can choose two of the activities from two different zip lines, waterfall repelling and/or tubing down the river. Last time I went, we arrived around 8:15 in order to miss any big tour groups that arrive during day. Don’t get me wrong, I love people, but hate having to be herded like cattle all day. Hence, why I recommend renting a car or going in a small tour group. We started out getting in our zip lining gear. I was with good friends and was joking about the last time I went and someone fell. Stupid joke…I then spent the next 15 minutes explaining the safety protocols they have to follow. In the end no one bailed and we finished the mini zip lining for dummies course they give you. Everyone got over their initial jitters and we were off and there was no looking back. Even people who are scared at first get over it by about the third platform. I love that this canopy cuts through a canyon. It’s completely different from the other zip-lines here. Rock walls on both sides with the river down below and the monkeys are the only ones cheering you on. This particular canopy includes a “mission impossible” drop, which I did upside down. I felt like Tom Cruise. It was awesome. 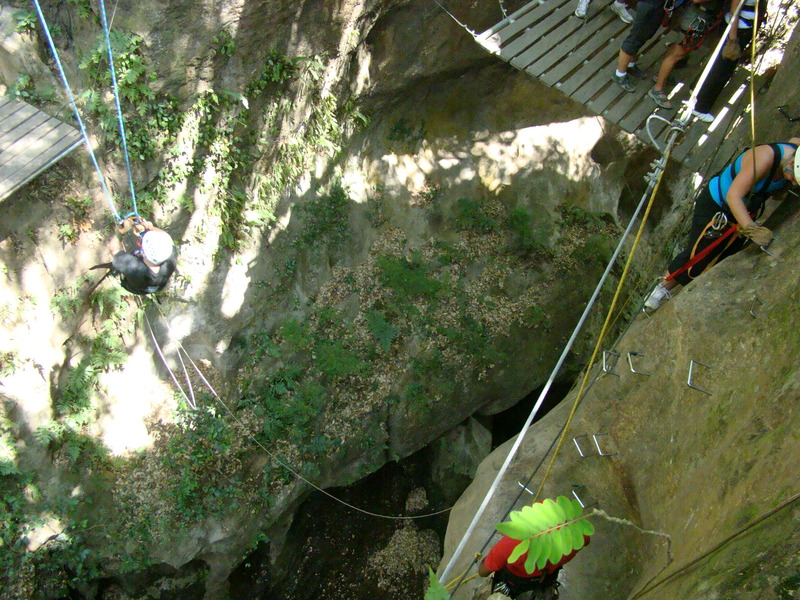 Basically, instead of going across on the zipline…you plunge down to the platform at the base of the river. You then swing across the Tarzan swing to the other side. I then felt like Jane. Then I was at a rock wall. They wanted me to climb it. I laughed and said “You want me to what???”. Soooo…then I felt a little like an overweight Spiderman. Thank god there is a guy up top to hoist you up once all your muscles give out. From there are a series of other cables and small rock walls. One of the small rock climbs between platforms. After that…I was ready for a drink, but not yet. We rounded up some horses and headed for a swim under one of the waterfalls with turquoise blue water on the property. We trotted back for lunch. The lunch alone is reason to go back over and over again. I’m not going to lie. I’m not a huge fan of the famous “Gallo Pinto“, I do eat the odd chicken casado or arroz con pollo. But this buffet style meal is amazing!!! It’s full of delicious typical food and fresh juices. My advice … Eat Up, because you’re going to need it for the rest of the day. We got back in the saddle and rode horses down to the river to the start of the tubing activity. It’s 5km down a river that runs down the side of a volcano in the jungle. You pass by beautiful trees, a waterfall, birds, lizards and troops of monkeys. Depending on the time of year the tour changes. It gets ridiculously fast in the rainy season because the river is much higher. Other times it’s a nice leisurely float with a few rapids. Make sure you bring some old running shoes because sandals are not going to cut it. For women, shorts are a better option than a bikini. After falling out a few times and laughing at other people falling out we proceeded back to the lockers in an old bumpy school bus. Although, most people then head off to the natural hot springs and mud baths. We changed into some dry clothes and headed to the little bar there for a couple of cold ones before heading home. (Another reason to hire a driver) There is also a hotel if you decided to stay the night. I’d recommend it as there is so much to see and do. A hike around the National Park is amazing and you could do that the following day. So there you have it…This day trip is the one I don’t think anyone should miss!!! This entry was posted in Adventure Tours, Costa Rica, Day Tours, Great Food, Hot Springs, Mountain Hotels, Spa, Uncategorized, Zip Lining and tagged Adventure, Costa Rica, Destinations, Guanacaste, Hacienda Guachipelin, Hot Springs, Liberia, Rincon De La Vieja, Rock Climbing, Spa, Travel, Tropics, Volcano, Zip Lining. Bookmark the permalink. 9 Responses to Best Adventure Tour In Costa Rica! I spent 6 years in Costa Rica and you never took me there?!?! What kind of friend are you? lol You better take me there on my next visit! Miss ya already C Grant! What can I say … I guess you have to come back!!!!!! Hi, I just stumbled across your blog from the blue river resort facebook page. What an amazing blog! I will be reading regularly now. I am planning my second trip to CR later this year and for part of our trip, we are either going to stay at the blue river resort or hacienda guachipelin. I feel kind of torn because we definitely want to do the tubing, but I really want to do the canyon canopy tour, but want to actually stay at blue river because of their amazing hot springs right on the property. Which do you recommend out of the two? I love Guachipelin for its activities. They also have hot springs and mud baths. If you are looking for an active adventure I’d say Guachipelin for sure. If you were looking for more relaxing remote retreat I’d stay Blue River. I’d say the accomodations at Blue River are nicer, but Guachipelin is more fun! Have Fun!!!! Ok. That’s what I was figuring. Blue River definitely looks like nicer accomodations but a little more relaxing. We are definitely looking for adventure. Thanks!